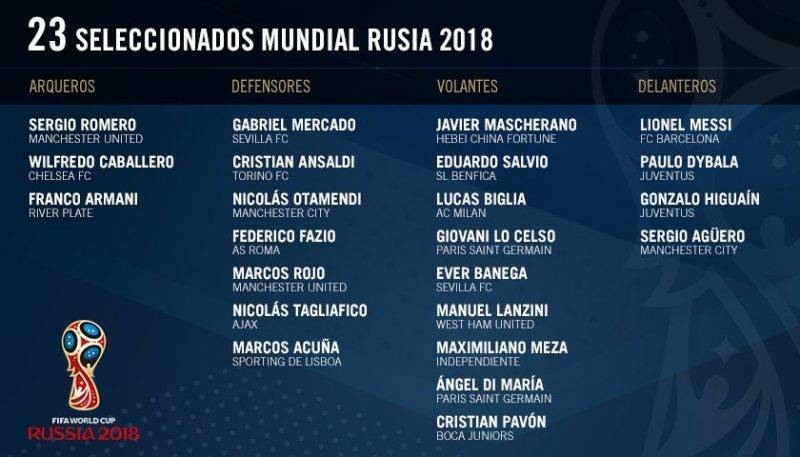 Jorge Sampaoli announced Argentina’s final 23-man squad for the 2018 World Cup at lunchtime on Monday as Lionel Messi will spearhead Jorge Sampaoli’s team into Russia, as they prepare to do battle in Group D against Iceland, Croatia, and Nigeria. Inter Milan’s hot goal-scorer, Mauro Icardi’s absence will still be disheartening to the Inter hitman, as he finished joint-top scorer in Serie A with 29 goals his season. Mauro Icardi, as speculated in the media has been snubbed from Jorge Sampaoli’s squad. The 25-year-old has scored 29 goals for club and country this season has been left out with two out-and-out strikers in Agüero and Higuaín, as Argentina does look like more solid both going forward and at the back. Paulo Dybala will be in Russia, though, as will Cristian Ansaldi of Juventus’ city rivals Torino. For a squad so heavily identified through the prism of Barcelona star Lionel Messi, it was the supporting cast, especially that in the attacking areas, that had fans and observers intrigued. Independiente’s midfielder and wide man Maximiliano Meza, perhaps the only player to come out of the 6-1 defeat to Spain in March with his standing increased, after an individually impressive performance. The inclusions of River Plate goalkeeper Franco Armani and Boca Juniors winger Cristian Pavón make this the first Argentina World Cup squad since 1994 to include at least one player from each of the country’s two club giants. Nicolas Otamendi and Sergio Aguero from Manchester City, Manchester United’s Marcos Rojo and West Ham’s Manuel Lanzini represent the Premier League for The Albiceleste.